Apicomplexans are unicellular protozoa that belong to kingdom Chromalveolata and the infrakingdom alveolata. Chromalveolates descended from a heterotrophic bikont (a bi-flagellated eukaryote), in which a secondary endosymbiotic event gave rise to a plastid-like organelle . Members of the alveolata are characterized by cortical alveoli (flattened vesicles located between the plasma membrane and a network of subpellicular microtubules), and micropore . They are further divided into phyla including ciliates, dinoflagellates, and apicomplexans, which differ mainly in their motile machinery [3, 4]. While ciliates and dinoflagellates move by means of cilia or flagella, invasive stage apicomplexans typically move by gliding motility. Additionally, many ciliates and dinoflagellates are free-living, while all apicomplexans are obligate parasites. The phylum Apicomplexa encompasses numerous important disease-causing pathogens including the agents of malaria, toxoplasmosis, cryptosporidiosis, Texas and East Coast fever, and coccidiosis. The most widely studied of these are Plasmodium species, agents of malaria  and Toxoplasma gondii, which causes toxoplasmosis . Apicomplexans undergo asexual (vegetative) replication in order to cause acute infection (Fig. 1a, b). During asexual replication, Apicomplexa use distinct cell division schemes of fascinating complexity and variability to adapt to different hosts and suit specific intracellular niches . Both Plasmodium and Toxoplasma can also differentiate into gametes and undergo sexual recombination (Fig. 1d, e). In Toxoplasma, this occurs in the intestinal epithelium of cats and the resulting oocyst is shed in cat feces and sporulates in the environment. New infections are initiated by accidental ingestion of oocysts in contaminated food or water. Toxoplasma may also be transmitted by ingestion of infected animals harboring tissue cysts that contain latent asexual stage bradyzoite forms. Plasmodium gametes complete development and fuse to form a zygote in the stomach of mosquitos that have taken up infected blood. The zygote penetrates through the gut epithelium and undergoes meiosis and many rounds of replication to produce sporozoites. These migrate to the salivary glands and infect a new host when the mosquito takes another blood meal. Significantly, the sexual cycle is obligatory to natural transmission of most Plasmodium infections. Electron microscopy established early on that apicomplexan microtubule organizing centers (MTOCs) are structurally different from centrosomes found in most model systems. Toxoplasma has two juxtanuclear centrioles, arranged parallel to each other. These exhibit a 9+1 singlet microtubule symmetry, and are shorter than their animal counterparts (200 × 200 nm) (Fig. 1c) [7–11]. Plasmodium species appear to lack centrioles; instead, the spindle microtubules originate from a MTOC known as the “centriolar plaque” (CP) that is located within the nuclear envelope. The CP can be identified using antibodies to centrin [12–14]. The invasive asexual stages of apicomplexans are not flagellated, and therefore neither of these MTOCs functions as a basal body. In both Toxoplasma and Plasmodium, only the male gamete, known as the microgamete, assembles basal bodies and flagella (Fig. 1d, e). Mature Plasmodium sperm have a single flagella (Fig. 1d) while Toxoplasma microgametes are bi-flagellated (Fig. 1e). In both cases, the flagellar axoneme consists of 9 doublet microtubules and a central pair (Fig. 1d, e) [15–18]. Basal bodies in malaria consist of nine single A-tubules with no central tube, embedded in an electron-dense mass (Figs. 1d, 2a) (see Ref. and Fig. 1f in Ref. ). The basal body microtubules extend 250 nm . Basal body structure, however, remains somewhat unclear in Toxoplasma. T. gondii differentiates into gametes and reproduces sexually within felines. Therefore, microgamete isolation requires heavy infection of felid enteric tissue. This is technically challenging, and a limiting aspect to the study of this stage of the parasite life cycle. Moreover, transverse sections through the basal body barrel are uncommon in ultra-structural studies. The small number of images obtained to date suggests nine short singlet microtubules, and a central tubule basal body structure, which closely resemble the asexual form’s centriole structure (Fig. 2b–e) [17, 20, 21] (see Fig. 2a–d in Ref. , and Fig. 25 in Ref. ). On the other hand, studies of gametogenesis in closely related apicomplexans (other coccidian such as Eimeria and Sarcocystis) suggest that T. gondii basal bodies could consist of either typical triplet microtubule structure with ninefold symmetry (see Fig. 3b in Ref. and Fig. 10 in Ref. 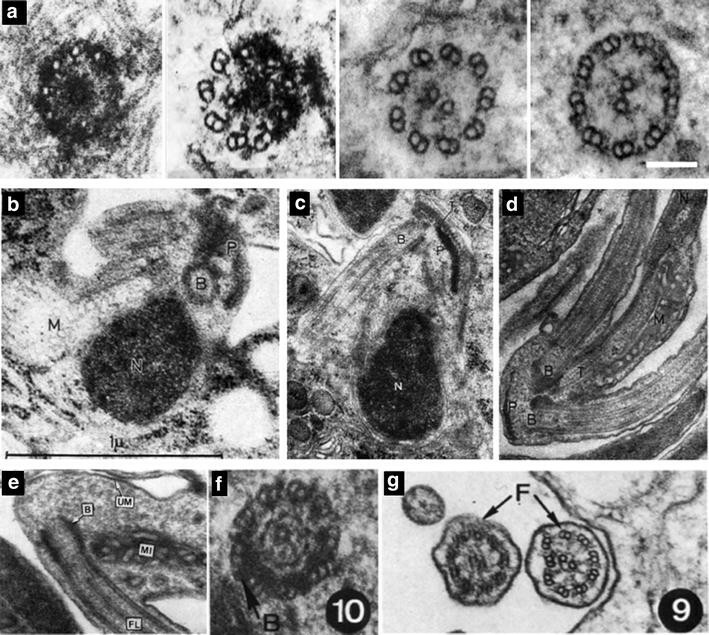 in Eimeria and Sarcocystis, respectively) or atypical 9+0 or 9+2 arrangements of singlet microtubules [8, 20, 22–26] (Figs. 1e, 2f). It is possible, however, that the latter correspond to serial sections through the transition zone or flagellar axoneme that are incorrectly interpreted as basal bodies. The Toxoplasma genome (available at toxodb.org ) contains genes for three α- and β-tubulin isotypes [28, 29]. Inferences from proteomes and mRNA data suggest that all isotypes are expressed at some levels in asexual forms and in oocysts  (Fig. 1a). The T. gondii genome also contains a single γ-tubulin gene, which has been shown to localize to centrioles [30, 31]. Both δ- and ε-tubulin isoforms appear to be present in the genome; however, publically available mass spectroscopy data (toxodb.org) do not provide evidence for expression in asexual forms. Therefore, T. gondii is likely equipped with the necessary elements to assemble triplet microtubule blades of basal bodies [32–36]. Whether δ- and ε-tubulin genes are expressed specifically in microgametes remains an intriguing question, as this could explain the developmental maturation of singlet centrioles into triplet basal bodies that template flagellar axonemes . Unfortunately, to date, expression data are not available for T. gondii gametes. In addition to α-, β-, and γ-tubulin genes, P. falciparum has single apparent homologs of δ- and ε-tubulin (PF3D7_1475700 and PF3D7_0933800, respectively), and neither is expressed at significantly higher levels during gametogenesis (expression data available at plasmodb.org). Apicomplexans use spatially and morphologically distinct microtubule organizing centers (MTOCs) to functionally organize independent microtubule subsets. Cell shape and polarity is organized by subpellicular microtubules nucleated by a ring-shaped MTOC localized at the cell apex, known as the apical polar ring (APR) (Fig. 1c). The APR consists of concentrically arranged tubulin rings, and a central pair of microtubules . Microtubules organized by the APR emerge in comma-shaped fashion and extend two-thirds into the cell length. Coccidian apicomplexans, including T. gondii, also construct an additional tubulin-based structure known as the conoid . The conoid is composed of fourteen tightly apposed tubulin-based filaments that spiral counterclockwise toward the pre-conoidal rings [8, 38]. It can be extended from or retracted into the APR. Though no direct evidence for its function has been demonstrated, a role in host cell invasion has been frequently ascribed to this structure . Plasmodium merozoites have a dramatically reduced set of subpellicular microtubules, also organized from an APR . Nuclear division occurs by closed mitosis: the nuclear envelope remains intact and spindle microtubules are inserted into pores in the nuclear envelope. In coccidians such as T. gondii, spindle microtubules are organized by a specialized structure known as the centrocone. The centrocone is a protrusion in the nuclear envelope associated with the cytoplasmic centrioles (Fig. 1c). In T. gondii, basal bodies have been proposed to either form de novo or to be derived from the pre-existing centrioles . However, because the basal body structure remains undefined, a number of hypothetical biogenesis pathways can be proposed. If basal bodies are composed of nine singlet microtubules and a central tube, pre-existing centrioles could become basal bodies directly. It is also possible that the singlet microtubule-based centrioles mature into triplet microtubule-based basal bodies by gamete-specific expression of δ- and ε-tubulin genes, giving rise to a more typical basal body configuration. Additionally, basal bodies could be synthesized de novo as is proposed to be the case in Plasmodium, in which case the alternative 9+0 and 9+2 singlet structures reported could be generated. Plasmodium sexual differentiation occurs in the midgut of the female mosquito vector . The signals that trigger differentiation and flagella formation (exflagellation) can be mimicked in vitro. Time course studies of the exflagellation process suggest that the basal body in Plasmodium forms de novo, but its position is defined by the pre-existing CP. Molecular data on how this process is regulated are lacking, but ultra-structural TEM studies suggest that the centriolar plaque and the emerging basal body are functionally and physically linked. A single study in the malaria-related parasite Haemoproteus columbae shows that the electron-dense mass of the centriolar plaque houses a single centriole made of singlet microtubules and a central pair prior to the appearance of flagella [16, 40]. This has been proposed to be an “intermediate” step in the formation of the basal body, which physically separates from the CP at a later stage, but retains a 9+1 singlet microtubule architecture . Consistent with the suggestion that Plasmodium basal bodies are formed de novo during microgametogenesis, expression of the conserved centriole component SAS-6 is restricted to microgametes . Moreover, SAS-6 knock-out parasites do not form motile microgametes . Additional basal body structures or accessory structures have not been described in the literature thus far. Gene expression data or proteomes from distinct stages of gametogenesis are not available, therefore limiting our understanding of the basal body and flagellar structural components and biogenesis pathways. Clear homologs of key regulators of centriole biogenesis in other eukaryotes, such as PLK4 or PLK1, are missing from the apicomplexan genomes [42, 43]. Therefore, the biogenesis of centrioles and basal bodies is expected to be distinct from other conserved assembly pathways. In fact, recent studies described divergent regulatory elements participate in the duplication of the T. gondii’s centrosome, suggesting that the centrosome replication pathway in Apicomplexa is non-canonical. A MAP kinase homolog (TgMAPK-L1, ) and a NIMA-related kinase (TgNEK1–2, ) were shown to play critical roles in duplication and maintenance of the “right number” of centrosomes structures in T. gondii. However, the exact mechanism by which they participate in centrosome duplication remains to be deciphered. In addition, an aurora kinase homolog (TgARK1) associates with centrosomes specifically in S-phase in T. gondii, when centrosome duplication occurs, suggesting that it too could play a role in the process . T. gondii centrosomes are organized into two independent functional segments, named “cores.” These cores are distinguishable in composition, and each of them coordinates functionally distinct aspects of cell division allowing the parasite for cell cycle flexibility and adaptability. The “inner core” facing the nuclear envelope coordinates chromosome segregation. Meanwhile, the “outer core” localizes distal to the nucleus, and coordinates the assembly of new daughter cells . Microgamete-specific proteomic studies have been achieved in Plasmodium because this stage is experimentally accessible, unlike the situation in Toxoplasma [45, 46]. These studies focused on identifying flagellar axoneme components, and while the results are informative for making inferences about axoneme properties, information on basal body components remains scarce. Plasmodium species lack intraflagellar transport (IFT) machinery [16, 47], and are devoid of most BBsome components which coordinate signaling functions in other flagella and cilia . The T. gondii genome contains homologs of CEP164, BBS5, and IFT components, suggesting that IFT drives axoneme assembly . These differences suggest that interesting differences in flagellar assembly pathways between these apicomplexans could exist: Plasmodium assembles flagella within the cytosol, while T. gondii microgamete´s flagella are likely to be extruded from the periphery. Both T. gondii and Plasmodium genomes lack many basal body components. However, they encode the “UNIMOD” components SAS6, SAS4/CPAP, and BLD10/CEP135 . Additionally, homologs of Meckelin (MKS3), a conserved protein linked to Meckel Syndrome, is present in the genomes of apicomplexans . As MKS3 assists centriole migration to the cell surface prior to flagella formation, this supports the model that pre-existing centrioles directly act as basal bodies. T. gondii, but not Plasmodium, encodes a VFL1 homolog , which establishes basal body orientation in the unicellular green alga Chlamydomonas . Nonetheless, whether these components are expressed or indeed participate in basal body and flagellar assembly is unknown, as the roles of these apparent homologs have not been studied in apicomplexans. It is possible that these genes represent remnants of an ancestral flagellar assembly pathway that has been discarded by T. gondii. Molecular data supporting this alternative hypothesis are discussed below. The infectious asexual forms of Apicomplexa do not assemble flagella and therefore lack basal bodies. Nevertheless, the microtubule-based structures present in apicomplexan asexual forms pose interesting evolutionary questions. Plasmodium and Toxoplasma genomes encode both a canonical SAS-6, which localizes to the centrosome , and a smaller protein of conserved N-terminal called SAS6-like (SAS6L). Canonical SAS6 self-assembles in vitro into geometrically defined structures, and this is thought to template the formation of the centriole cartwheel . Overexpressed SAS6L assembles into filaments in a microtubule-independent fashion . In Toxoplasma tachyzoites, SAS6L localizes to the conoid at the parasite apex, some distance from the juxtanuclear centrioles . Interestingly, the Plasmodium SAS6L homolog is up-regulated in gametocyte development suggesting that it may play a role in basal body assembly in non-coccidian apicomplexans. The conoid also establishes a physical connection with proteins known as striated fiber assemblins (SFAs) . In flagellates, SFAs contribute to the basal body rootlet system which orients the basal bodies relative to other subcellular structures [52, 53]. Apicomplexan SFAs are highly similar to SFA in flagellated algae such as Chlamydomonas [52, 54]. However, apicomplexan SFAs are expressed in the absence of flagella during asexual replication. Apicomplexan cell division occurs by internal assembly of daughter cells within the cytosol or at the surface of the mother cell . These SFA fibers form immediately after centriole duplication and establish a physical link between the duplicated centrioles and the emerging daughter APR and conoid structures . This connection is essential to ensure the proper segregation of genetic material to the emerging daughter cells, as the centrioles remain durably connected to the chromosomes by way of the mitotic spindle throughout cell division [7, 55]. Interestingly, the non-apicomplexan alveolates Colpodella vorax and Rastrimonas subtilis construct pseudoconoids which are somewhat similar to conoids. Unlike in apicomplexans, these organisms build flagella adjacent to an apical pseudoconoid structure. It has been proposed that in adapting to parasitic lifestyles apicomplexans lost their flagella. However, the basal body and the conoid may be linked by historical interdependence. We and others have hypothesized that the non-flagellated forms of apicomplexans may have maintained ancestral basal body accessory structures to aid in organelle inheritance during cell division [51, 52, 56]. Basal bodies with associated flagellar axonemes are assembled only during microgamete formation in the sexual stage of the parasite life cycle. The sexual stages of apicomplexans are of great interest to the research community as they are required for generating genetic variation in both T. gondii and Plasmodium. They are also required for transmission of malaria in endemic areas. To date, we know that basal bodies are structurally and compositionally different from their mammalian counterparts. It is likely that their precise composition, organization, and construction are all distinct. However, our molecular insight into these structures remains superficial. Tubulin-based structures have been validated as anti-parasitic targets in T. gondii , and blocking transmission in mosquitoes has been proposed as a viable route for malaria prevention [16, 41]. Better understanding of the molecular components and biogenesis of apicomplexan basal bodies and flagellar axonemes is critical to meeting these goals. Obtaining microgametes in vitro is technically challenging, and currently represents the major rate limiting step in the advance of our molecular understanding of these cells. Efficient technology to promote the differentiation of asexual forms into microgametes in vitro or ex vivo could greatly impact our ability to understand differentiation at the structural and molecular level of these important human pathogens. Efforts focusing in developing these technologies should be at the center of Apicomplexa basal body research in the future. MEF drafted the manuscript. JFD helped to draft the manuscript. NM helped to draft the manuscript. All authors read and approved the final manuscript. M.E.F is funded by an EMBO long-term postdoctoral fellowship.